Wow, good for you! And you look super cute in that picture. Wow, I have been eyeing the C25K program on and off for years but never thought (and still wonder) it would work for me. I didn’t think it would work for me. I am so skeptical of everything, it’s just ridiculous. But if you want to run, I would definitely try it. It’s free! It’s doable! You don’t really have much to lose, if you think about it 🙂 it worked for me, and I was about as far from a runner as a person could be. I actually think I’m going to do it again to get back on track. I am really thinking about it, maybe as a goal for later this year when I have gotten my eating under more control. I think I also feared I would look ridiculous running and walking and even trying to run. I am pretty tall and awkward, but I’m just being ridiculous. I have some back problems I would need to be cognizant of, but of the times I have had to jog or have had an intense workout, I start to think that running would become a very healthy addiction. the day you had to run the mile in school was totally my most dreaded day…and you’re right, i actually don’t think they do this anymore. 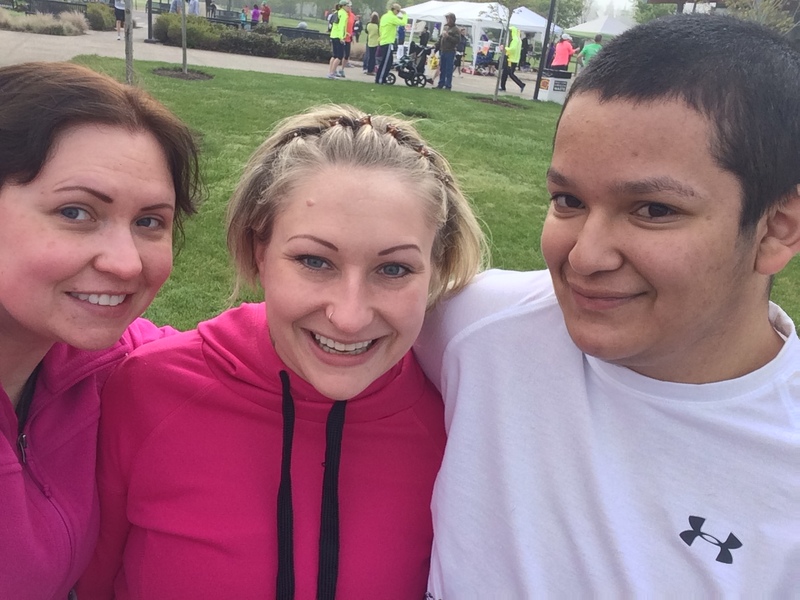 i recently just started running too, and did my first 5K last september. i’m not really built to be a runner with my short legs, but i’m trying 🙂 congrats to you on the half marathon! It is great to see your persistence to keep at it. It shows that mentally you were in a good place, even though you didn’t feel so much physically. There is more to being good at something than just raw talent. As they say, practice makes perfect!! I was going to comment saying that I hate running, but I realized this morning (on my morning run) that I actually really enjoy being outside (when the weather is nice) in the early morning for a run. The fresh air, the sunrise, the quiet peacefulness, and the feeling of being fit… I guess that’s what they call a runner’s high, right? I started running because I wanted to be fitter and faster when playing soccer, but I have since taken on running as its own thing. That’s so cool!! It’s so funny, it took me at least a year before I ever felt the runner’s high. I just kept doing it, even though I hated it. I really just felt super excited when it was over. I love that you are able to enjoy it (at least some of the time) now. That is also really great about your half marathon time! The only reason I got 2:17 on my first one was because I had a girl that truly runs with me. She pushed me so hard! On my second one I hit every well that I could find and finished in 2:33. I was crushed. Then when I got 2:10 on my third try- thrilled. You can do it! And if not… keep trying. It’s awesome that you’re into running! So many people in my life are, but I’ve yet to take the plunge. I have chronic asthma which makes it hard to do super intense cardio. I admire you! Here’s a weird, weird thing that may or may not work for you. My nurse friend tells me that this doesn’t work, but for some reason when I keep super hydrated, I have less problems with my asthma. When I go on a run, I wear a Fuel Belt and carry a total of 32 ounces of water- even if it’s four or five miles. Everyone makes fun of me, and I don’t care. For some reason when my throat gets scratchy, I start coughing, then it irritates my lungs, and it’s all over. If I take a sip of water every few minutes, I’m almost always fine. I also have to go slower, because running brings my heart rate up super fast. If it gets too fast that aggravates my lungs and I slow down and use my inhaler. It’s annoying, but both of these things really help. I do totally avoid running when it’s super hot or super cold, there’s nothing that fixes that. 🙂 you should definitely try it. Obviously start slow and be careful. I would start at a gym or busy area in case something goes wrong, but it’s totally possible. Asthma doesn’t always have to win. Dumb asthma. 🙂 I am the same way with the secret racing, I think most of us are. I have learned not to push myself too much though. However, that’s totally why I posted my times. I know that I love to read running blogs and compare how I am to other people. Possibly unhealthy, but I thought I would indulge others in the hobby! Let’s race! Good on you Jillian. I trained with a group of women and the logo for the group was a dragonfly because a dragonfly can adapt to whatever challenges it faces. For me it was all that because at the beginning you question whether you can go the distance. When you say out loud you can, you do. Running has always been a high for me and the dragon fly is tattooed on my ankle. I love it! I love that story! I never knew that about dragonflies. What a good inspiration for a tattoo. I have a love/hate relationship with running. My problem is that I’ll have periods where I stop running and lose my endurance. I did a 5k in October and then quit running until recently. I’ve done 3 5ks and I’ve found that having a race is the best way to motivate me to run. Completing a half is on my 30 by 30 list, so I’ll probably try that next year. Races are great for motivation for me, too. It also really helps me to run with a friend, but it’s so hard to find someone that’s a good match. Thanks 🙂 it’s still a work in progress, but I’ve certainly come a long way.